Every major religion has six dimensions. These are ritual, doctrine, ethics, social, experiential aspects and mythology. Ritual forms an important part in all religions. But these differ from religion to religion. In doctrine or theology, beliefs and religious experiences are systematised. Religions also have a tendency to incorporate moral codes and this is how the ethical dimension of religion arises. Religions tend to be organised in institutional form and so there is a social aspect. All major religions have a mythological component. The core of all religions, though, is the experiential element. The word ‘myth’ has often come to be known particularly in the west as something not true or factual. A myth is a story which encapsulates something believed to be true by a large group of people bound together by common beliefs. In using a form of story the myth does not concede that it is ‘only a story’. It tries to find a way of conveying a truth too profound to be dealt with in a matter-of-fact manner. It may not be something that can be measured or analyzed in an empirical way. The western world because of the dramatic impact of science and technology is suspicious of anything not literally true and too hastily discards myths. There is a grand mythology surrounding Lord Ganesha. The very image of Lord Ganesha invokes awe and surprise. He has a huge body matched by a huge head. His vehicle is a small mouse. A large trunk and two tusks one half broken. He holds in his hands a noose, a goad, a plate of sweets and in the fourth hand holds forth the promise of abhaya. All these have messages for us. The noose in his hands reminds us that our attachments must be under our control. We should not get too attached to fleeting objects of the world. The goad is the device a mahout uses to discipline the elephant. By holding the goad in His hands, Ganesha teaches us that self discipline is the best discipline. The abhaya hasta reminds us that we are all safe and under His protection. Lastly the plate of sweets reminds us that life is meant to be enjoyed. It is God’s gift to us and like all of His gifts it is extremely valuable. Irrespective of the incongruities of the form He has a large following. All denizens of the three worlds worship him and no activity is started without His consent. He is the one whose worship is multi-religious and multi-cultural. 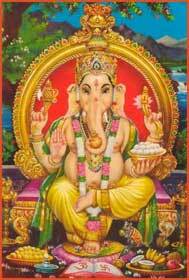 There are images of Ganesha found in Churches in New York as well as in Indonesia. 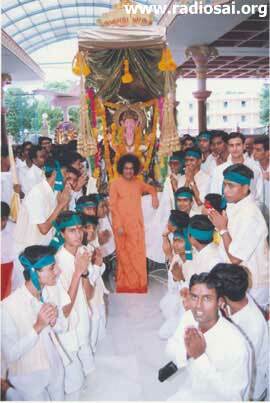 People celebrate his birthday with great joy and religious fervor. The advent of Ganesha is lost in the mists of time but He is mentioned even in Vedic literature. The mythological story relating to His birth is well known. Goddess Parvathi wanted a reliable person to ensure that her privacy is not intruded and so created a baby from her own body and breathed life into it. And the baby boy was very handsome and brave. She armed him and asked him to stand guard. Lord Shiva returned from his meditation and wanted to enter the house. The boy challenged him and no amount of persuasion worked. Lord Shiva ordered his ganas to wage war. But the boy was too hot to handle even for the ganas and their leaders who beat a hasty retreat. It required almighty Shiva Himself to behead him. Parvathi entered at that very moment and saw her creation destroyed and was distraught. The Lord offered to restore the life of the kid with the head of any being lying down with his head pointing south and thus Ganesha received an elephant’s head. This story is just symbolic. It shows we are created for God’s own pleasure and have a role to play in this world. Utter loyalty to the mother ensures Her blessings and invincibility. The beheading and subsequent crowning with an elephant head may just be symbolic of bookish knowledge being converted to practical knowledge, of knowledge being converted to wisdom. 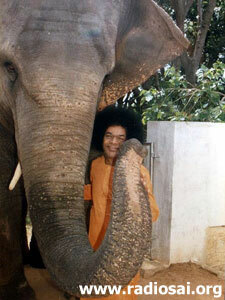 Shiva’s choice of an elephant’s head is to show us that we should be intelligent in our choice. Sai Geeta seems to be smarter than us as she pines incessantly for Swami’s presence. In the olden days when Swami used to go to Brindavan for the summer, Sai Geeta would shed tears and not eat until she was brought to Brindavan. Recently when the place was being cleared for the indoor stadium in Parthi, the engineers realised that Sai Geeta’s shed would have to be relocated. They went with a proposal to build a shed near gokulam but Swami insisted that Sai Geeta would feel bad and hence she should be relocated nearer to the mandir! The big ears of an elephant remind us to listen patiently to other’s point of view before taking decisions. When an elephant walks through a forest it creates a path for all to follow. In this sense we should become trendsetters. We should do things which the world will follow and not merely ape others – particularly in things like our dress and conduct. Lord Ganesha broke His tusk and used it for recording Vyasa’s dictation of the Mahabharatha. The Mahabharatha was sure to benefit mankind and He gave His all for it. This is the true meaning of the saying ‘Paropakaarartham idam shareeram’ (Utilise the body in the service of others). Suklambharadharam [the one with white garment on]: wear immaculate white (pure) clothes. Vishnum [all-pervading]: be present everywhere where you supposed to be in time. Sashi varnam [of bright complexion]: have the vibhuti spot on your forehead. Chatur bhujam [who has four hands]: be an achiever, be industrious. 1.Whatever the Ferrari or Merc you may have, nothing can compare to your use of intelligence - your mind. Machines can never match the mind or the power of an idea! 3. Any venture undertaken that honours our parents will surely make us victorious. 1. Be trend setters not mere imitators; set ideals for the world to follow, do not be mere slaves following fashion trends set by others. 2. Master the mind to win the rat race. 3. Keep your attachments in check. 5. Listen attentively to all. 7. Make life a celebration. Let us remember and reflect these lessons in our daily life as we celebrate the advent of Lord Ganesha on the Ganesha Chaturthi Day which falls on the 27th of this month. (From a talk given in the assembly at the Brindavan Campus of Swami's Institute on the 10th of June 2006 by Dr. T. Ravi Kumar, a faculty member in the Department of Chemistry).